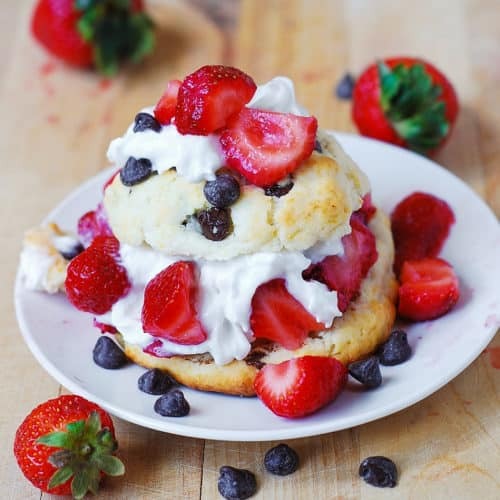 Chocolate Chip Strawberry Shortcakes – these are just like a regular strawberry shortcake recipe with the addition of chocolate chips to the cake batter. YUM! With this recipe you could easily get 6 or 8 biscuits. Eight make them normal size shortcakes, while 6 works for a pretty large serving. The biscuits are buttery, flaky, delicate, yet crisp on the outside – very tasty! The key is not to handle the dough too much, to keep the butter flakes in the dough cold. Make sure your oven is actually preheated so that you can bake the biscuits right away, without letting them sit on the counter. This way, you will get shortcakes that are soft on the inside, and crispy on the outside. The shortcakes will be very flaky, and you have to be extra careful when cutting each in half to avoid it crumbling apart. Use serrated knife. To make strawberry topping, just combine strawberries with sugar and let them sit for a while (maybe, 30 minutes) to bring out their juices and form a syrup. If you enjoyed these chocolate chip strawberry shortcakes, be sure to check out this Strawberry Chocolate Chip Cake and these Strawberry Cream Cheese Cookies. 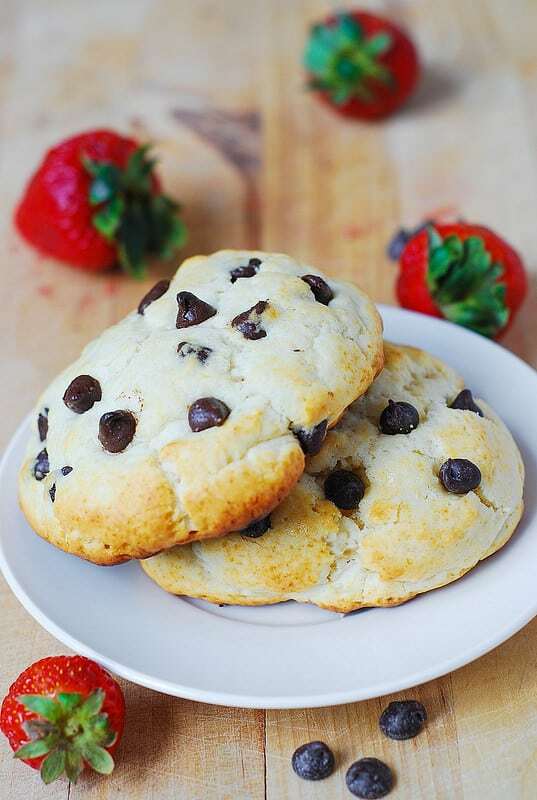 Individual servings of Chocolate Chip Strawberry Shortcakes - these are just like a regular strawberry shortcake recipe with the addition of chocolate chips to the cake batter. Easy to make and so good! Combine sliced strawberries and sugar in a large bowl and mix together. Let the strawberries sit in sugar for a bit to bring out their juices and form a very yummy syrup. In a food processor, combine and process flour, sugar, baking powder, and salt. Chop cold butter in small cubes, add to the food processor and process until the mixture resembles coarse meal. Add milk, and pulse a few times just until combined. Turn off the food processor, remove the blade, then, using spatula, fold in chocolate chips, avoiding to handle the dough too much. Move the dough onto a lightly floured surface. With floured hands, divide the dough into 6 or 8 equal portions, and drop the dough in small flattened balls on the prepared baking sheet. Bake the shortcakes for about 15-20 minutes, until the tops turn golden-brown. For decorating purposes, after 10 minutes of baking, remove the baking sheet from the oven and carefully place extra chocolate chips on top of each shortcake, lightly pressing the chips in so that they remain on top (which already gets crusty) and don't fall off - and then, return the baking sheet to the oven, and continue baking for the remaining amount of time. Let the biscuits cool. Using serrated knife, slice each biscuit in half. To serve, place the bottom side of biscuit on a serving plate, top with strawberries, then whipped cream. Place the top side of the biscuit on top, then add more cream or strawberries or both! Sprinkle a few chocolate chips over the each serving. Oh my! 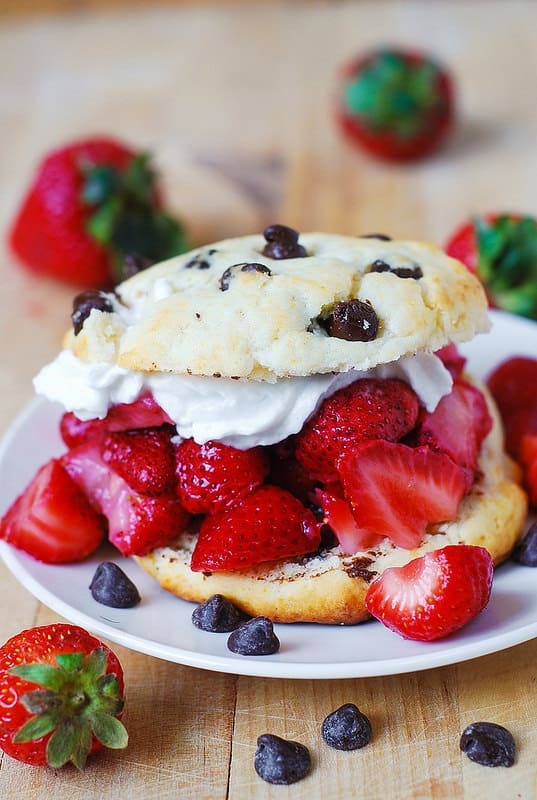 The Chocolate Chip Strawberry Shortcakes are enchanting! An exceptional summer treat! Great idea combining the chocolate chips into the shortcake. Looks amazing! 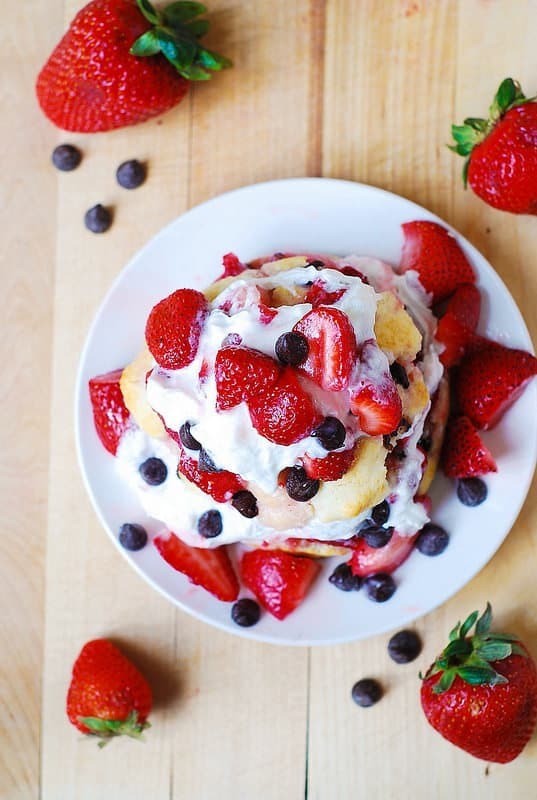 What a great way to jazz up a classic summer dessert! 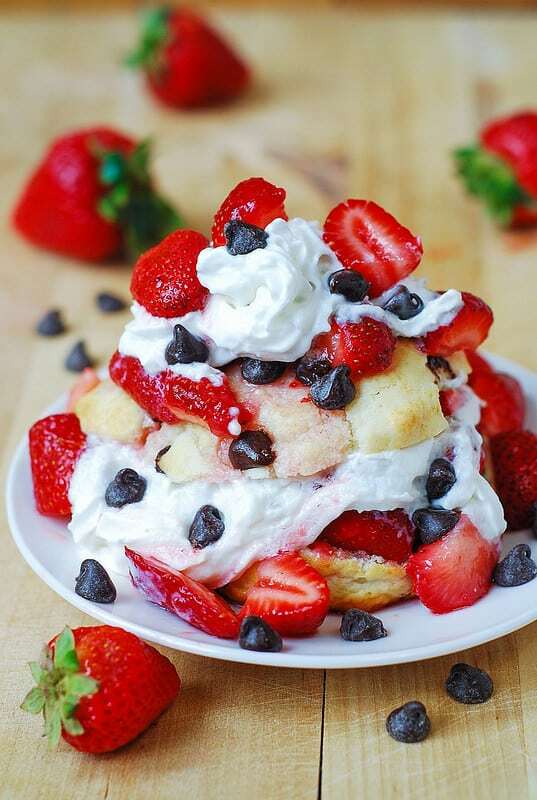 Next time I make strawberry shortcake, I will definitely be adding chocolate chips. Strawberry shortcake is one of my favorite summer desserts! 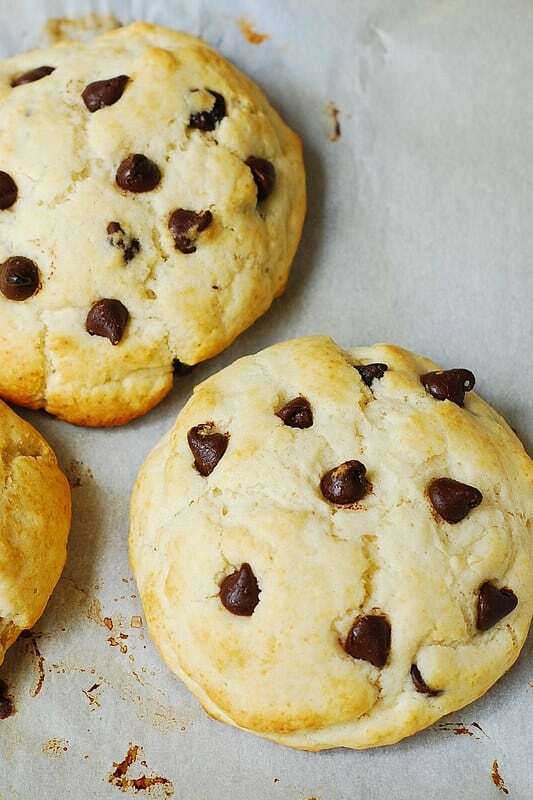 I love that you added the chocolate chips! Happy looking plate! And happy me looking at it. Beautiful Summer delight! I always love your photos and recipes…vibrant colour makes me happy. 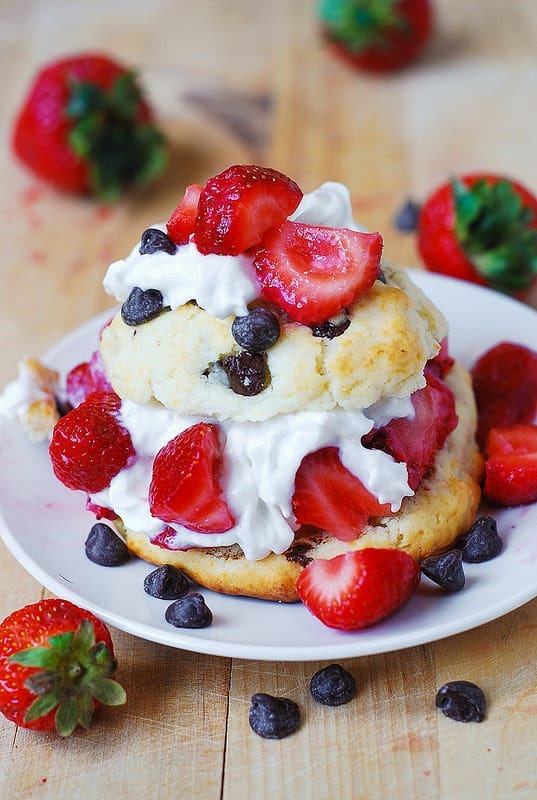 The shortcake with seasonal berries and chocolate…simply divine! Julia, these are gorgeous and very decadent looking! 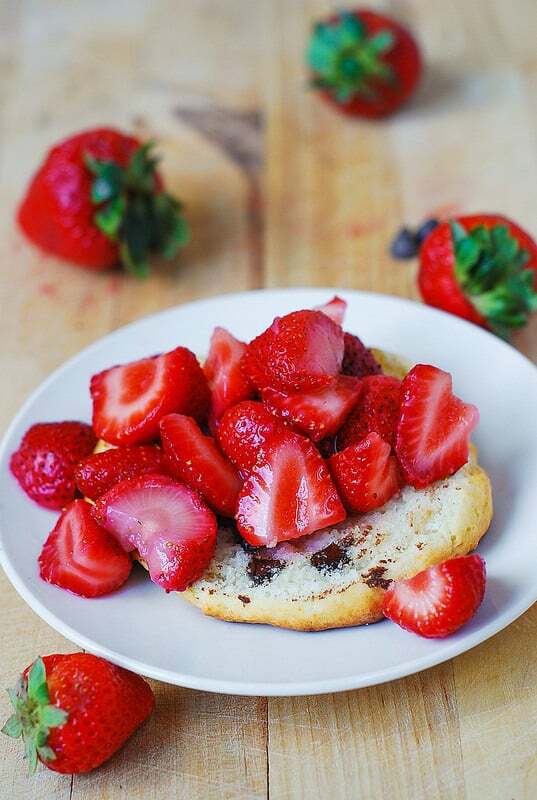 What a great idea to add cc to your shortbread and yes, you’re right strawberries and chocolate are a heavenly combination!